18V ONE+™ Grass/Shear Shrubber is rated 4.7 out of 5 by 137. Rated 5 out of 5 by Julesw5 from So easy to use. It’s so easy to use!!! It’s not your gas powered trimmer but for a household use, it’s excellent!!! Rated 4 out of 5 by scooper47 from Lots of power Digs into the toughest grasses with ease. But the quick change feature comes with an annoying drawback. The large plastic nut that connects the grass and shrub attachments extends a full 3/8 inch below the grass trimmer blade, so you cannot cut grass flush with the bottom. It requires you to cut curbside grass at a downward angle, constantly grinding away at the plastic nut. I am afraid that the nut will wear out in a couple of years of use. I would rather see a recessed machine screw used to hold on the attachments. I would recommend the trimmer to others with a caution about the retaining feature. Rated 5 out of 5 by Bob13425 from Ryobi Grass Shear and Schrubber is Excellent! My Ryobi - 18V ONE+ Grass Shear and Shrubber is the most borrowed tool I have and no one wants to bring it home! Everybody says it's the best tool they have used to trim large and small shrubs. I use it nearly every weekend and I never have to recharge it in the middle of my work. It's well made and balances nicely in the hand and it cuts like a much larger shrubber. This is a very valuable tool as well as one all your neighbors will all want to borrow so get ready to attend all those barbeques your neighbors will offer you! I've gained 20 pounds since I bought this tool! Rated 2 out of 5 by KAETX from Great Idea - Poor Design Got this in this in the spring. Found that the plastic to plastic gears are half wore down already. If you encounter the smallest woody twig the cutters jam but the motor continues to try to turn - hence the wear down of the plastic.. Needs to be a clutch of some sort on the motor for when great resistance is encountered. Rated 5 out of 5 by ddrg from Great touch up tool! I purchased the One+ grass / shear shrubber tool to touch up our Bougainville plants between visits from our landscaper. I have a 22" AC powered shrubber which is heavy, inconvenient to use, and requires one to drag a cord behind. The Ryobi tool has two cutter heads: a 4" grass trimmer, and an 8" shrubber bar. The two cutters are easily interchanged and are held in place with a knurled knob. I find holding the tool with the shrubber bar easily a one handed exercise versus a longer bar with AC cord dangling behind. Of course, no chance to cut a cord, but you do have to be aware of your fingers! Rated 5 out of 5 by D Hjort from Awesome Bought this for my wife as she has been wanting a cordless grass shear for years. This model came with a small hedge trimmer which wasn’t really a necessity for her, but it was with it anyway. After we charged the battery fully, she went outside to her fairy garden with the grass shear. She was totally amazed. Not only did she trim up the whole fairy garden, but she put the hedge trimmer on and cleaned up 5 more overgrown bushes before the battery needed charging. She came running to me shouting “You got to see this! This tool is amazing!” She told me to rate it 10 stars if I could. Rated 4 out of 5 by yardlady90001 from Lots of power Just bought and have not used the hedge trimmer feature yet. But this tool has great power and trims around garden beds great. BUT I do not like the safety feature white button. It requires too much strength to engage and then makes it very awkward to hold the tool and trim. I must push in the button with left hand and use right hand to use trigger. So I am having to use two hands to use the trimmer. Maybe no one else has this problem but I do. And if you have arthritis in your hands it is even more difficult. But it is a much better tool than the Black and Decker trimmer. Rated 5 out of 5 by TimmF from More than enough power Picked this up at Home Depot yesterday and tackled my backyard today. I gotta say, this little beast tore through everything from grass and weeds to shrubs and tree branches. I was surprised at some of the branches it could get through. Beats doing it all with handheld clippers. Changing from one accessory to the other was super easy. Not too loud. Good battery life. I was using it for at least 2 hours and never ran out of battery. Good weight. Did not tire out my arm. Grip was comfortable but the safety switch was a little annoying as you have to push it in every time you press the trigger. 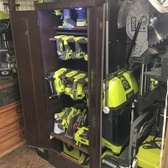 I have 4 other Ryobi products and I love that I can use the same battery with everything. Overall, I'm glad I made the purchase. 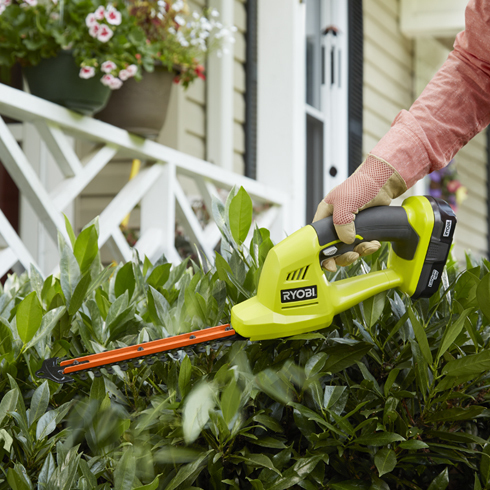 Maintaining your yard is simple with the RYOBI ONE+ Cordless Shear/Shrubber. 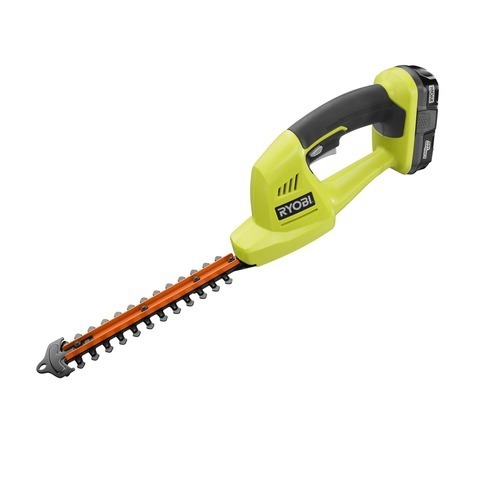 This amazing tool features a quick connect system that allows you to easily switch blade types, saving you time and helping you keep your hedges perfectly manicured. 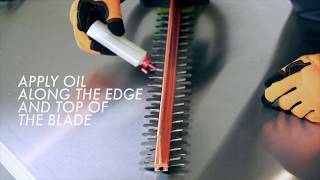 The Shear/Shrubber also comes with a RYOBI 18-Volt Lithium-Ion battery! 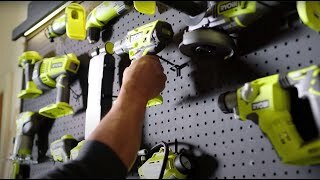 As with all other ONE+ tools, the battery included with fit over 50 other RYOBI 18v products! With all of this plus a 3-year warranty, you can't go wrong with RYOBI!